About a year ago, I was contacted by the University District Food Bank (UDFB) to see if Impact Capital would be interested in providing a bridge loan for the Seattle nonprofit's capital campaign. The campaign would be raising over $3 million for the 32-year-old food bank to move out of its leased space in a cramped church basement, buying a larger space at the Low Income Housing Institute’s University Commons project, a new mixed-use affordable housing complex near the University of Washington. As a nonprofit community development financial institution (CDFI), Impact Capital has helped serve marginalized communities in the Northwest by providing financing for development projects in Washington state for more than 20 years; we expanded to Oregon's Portland market last year. We primarily operate in the affordable housing realm, but it's not unusual for us to provide financing for community facility projects, too. I was intrigued by UDFB's pitch, because the project aligned perfectly with our mission while creating dynamic local partnerships for this and future projects. Once I started underwriting the loan, however, it became apparent that the construction lender’s loan terms were not favorable to a food bank's financial well-being. Prompted by my questioning, the Low Income Housing Institute tried to work with the lender for better terms, but ultimately parted ways when an agreement could not be reached. Fortunately, another lender, KeyBank, expressed interest in the project and offered a much more agreeable financing structure — saving UDFB roughly $200,000 in interest payments over the course of construction. "We were keenly aware of the capacity issues at the existing food bank and the tremendous need for a new, larger facility ... something they had been working on for several years," said Aubré Dickson, vice president in KeyBank’s Community Development Lending group. "We were excited for the opportunity to play a major role in making this dream a reality." The walk-in food bank serves more than 1,100 families every week, along with a delivery program for 80 homebound seniors and a backpack program to provide children at eight nearby schools with weekend meals. The savings provided enough funding to add a rooftop garden back into the construction plans. "As we consider our long-term vision for broadening our food bank's response to community food insecurity, a rooftop garden is integral to both improving our produce options for food bank customers when they shop with us and for enhancing the nutrition education work we do with customers and volunteer school groups," said Joe Gruber, UDFB executive director. He added, "The investment from Impact Capital was critical to moving this project forward for us, in order to minimize the impact of large multi-year pledges on the construction start date and to allow us to look for the best possible terms for our construction loan." Underwriting a food bank. Impact Capital underwrites loans to nonprofit affordable housing developers who, due to the nature of their activities, have very complex financial statements. We typically close 15 to 20 loans a year that range from $85,000 to $2 million. While there was a learning process for us to understand how food banks operate financially, switching gears to underwriting a different type of nonprofit organization was relatively easy. Sizing the loan. We estimate that our bridge loan to the food bank will come out to about $800,000, repaid within three years. KeyBank also required us to provide a $2.75 million dollar guarantee, in case the food bank's fundraising efforts failed. Since Impact Capital has a great understanding about the affordable housing development process, we felt comfortably committing to this amount while the food bank's capital campaign continued to raise funds during the construction process. Questioning the deal structure at a late juncture. UDFB had approached us in February 2015, roughly three months prior to the planned construction closing and its deadline to secure the necessary financing. Acting on our mission, expertise and commitment to helping our nonprofit partners succeed, Impact Capital raised questions about the deal structure and how it adversely affected the food bank. This was a stressful step in the process, as it led to the departure of the existing lender, and a new lender had to be found in an extremely short amount of time to meet the project's deadlines. It proved to be a worthwhile effort, however, as a better offer was found that helped save the food bank significant amounts of money. Comfort with ambiguity and risk. When UDFB came to us, it had an aggressive capital campaign underway, but only had a portion of the funds pledged. Impact Capital, through the underwriting process, had to become very comfortable with the fundraising team's plan and confidence in reaching the goal. Ultimately, we accepted this challenge in order to help meet the food bank's mission, and the project broke ground on June 16, 2015. Building relationships for a common goal. 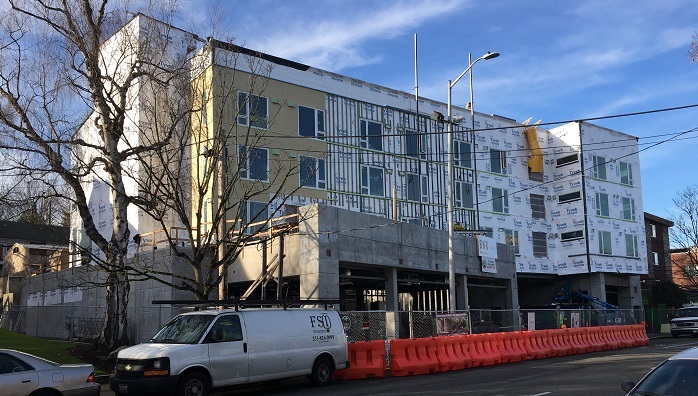 In the interconnected network of community-building organizations, our relationships and knowledge from the affordable housing industry played an integral role in this project. Relationships, both organizational and personal, built with Low Income Housing Institute, KeyBank, and the City of Seattle eased Impact Capital’s underwriting process as our understanding of their roles, and the trust we could place on their responsibilities and performances, were instrumental in underwriting the project. Strong networks make strong partners. Philanthropy Northwest's network contributed to this project every step of the way, from providing financing to supporting the food bank’s capital campaign. Contributing members included KeyBank, The Norcliffe Foundation, The Russell Family Foundation, Norman Archibald Charitable Foundation, Washington Women's Foundation, Seattle Foundation, Horizons Foundation, Employees Community Fund of Boeing Puget Sound and the City of Seattle. The new 6,200-square-foot facility, scheduled to open this summer, will allow UDFB to double the number of families served and accept more fresh produce and other perishable donations. The building is also wheelchair-accessible and features a warm, dry waiting area. Impact Capital will formally close its loan with the food bank to provide the necessary financing to purchase their brand new space, and the food bank will continue to raise funds through its capital campaign to repay our loan over the next three years. And we're excited to continue working together to introduce Impact Capital to other food bank organizations, to see if we can play a role in helping them achieve their goals, too. Seth Benziger is Impact Capital's vice president of lending. If you're interested in sharing an "Impact in Action" story about a Northwest impact investment on our blog, contact Nicole Neroulias Gupte, Philanthropy Northwest communications manager, at ngupte@philanthropynw.org.